When you first create an Excel sheet, numbers and labels appear as plain text. Plain labels may look boring in Excel, but plain numbers (such as 8495 or 0.39) can be difficult to read and understand if the numbers are supposed to represent currency amounts ($8,495) or percentages (39%). To make labels visually interesting and numbers appear more descriptive of what they represent, you need to format your data after you type it in a spreadsheet. In Excel, you can format a cell or range of cells after you’ve already typed in data or before you type in any data. If you format cells before typing any data, any data you type in that cell will appear in your chosen format. Select one or more cells by using the mouse or keyboard. To select multiple cells, drag the mouse or hold the Shift key while pressing the arrow keys. Click the Number Format list box in the Number group. The Number Format list box lists the different ways you can format the appearance of numbers. The Number group also displays three icons that let you format numbers as currency, percentage, or with commas in one click. If you click the downward-pointing arrow to the right of the Accounting Number Format icon, you can choose different currency symbols to use. The different ways you can format money. Click a number format style, such as Percentage or Scientific. Excel displays your numbers in your chosen format. Because many people use spreadsheets for business, they often want negative numbers to appear highlighted so they can see them more easily. Excel can display negative numbers in parentheses (–23) or in red so you can’t miss them. Select the cell or range of cells that you want to modify. Click the Format icon in the Cells group. The Format icon lets you format the appearance of rows, columns, or individual cells. The Format Cells dialog box lets you customize the appearance of your numbers. In the Category list, choose Currency or Number. 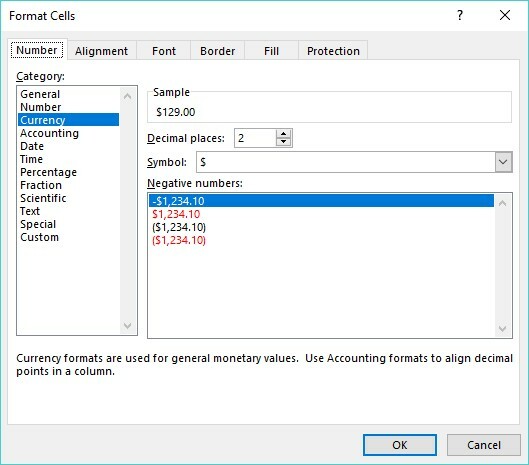 You can choose how to format negative numbers only if you format your numbers by using the Currency or Number category. Click a negative number format and then click OK. If any of your numbers changes to negative in the cell or cells you select in Step 1, Excel automatically displays those negative numbers in the negative number format you choose. Select the cell or cells that contain the numbers you want to format. Click in the Number Format list box and choose a format that displays decimal places, such as Number or Percentage. Excel formats the numbers in your chosen cells. In the Number group on the Home tab, you can click the Increase Decimal icon (increases the number of decimal places displayed) or Decrease Decimal icon (decreases the number of decimal places displayed. To make your data look prettier, Excel can format the appearance of cells to change the font, background color, text color, or font size. Select the cell or cells that you want to format with a built-in style. Click the Cell Styles icon in the Styles group. A pull-down menu appears listing all the different styles you can choose. The Cell Styles menu offers different ways to format your cells quickly. Move the mouse pointer over a style. 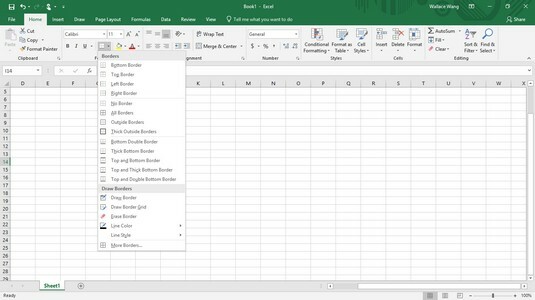 Excel displays a live preview of how your selected cells will look with that particular style. Excel applies your chosen style to the selected cells. Different fonts can emphasize parts of your spreadsheet, such as using one font to label columns and rows and another font or font size to display the data. Text styles (bold, underline, and italic) can also emphasize data that appears in the same font or font size. Select the cell or cells whose font or font size you want to change. Click the Font list box. A pull-down menu of different fonts appears. Click the font you want to use. Click the Font Size list box and then choose a font size, such as 12 or 16. Click the Font Size list box and type a value such as 7 or 15. Click the Increase Font Size or Decrease Font Size icon until your data appears in the size you want. Click one or more text style icons (Bold, Italic, Underline). Select the cell or cells that you want to color. Click the downward-pointing arrow that appears to the right of the Font Color icon. You can display data and the background of each cell in a different color. Click the color you want to use for your text. The color you select appears directly on the Font Color icon. The next time you want to apply this same color to a cell, you can click the Font Color icon directly instead of the downward-pointing arrow to the right of the Font Color icon. Click the downward-pointing arrow to the right of the Fill Color icon. Click a color to use to fill the background of your cell. The color you select appears directly on the Fill Color icon. The next time you want to apply this same color to a cell, you can click the Fill Color icon directly instead of the downward-pointing arrow to the right of the Fill Color icon. Click the downward-pointing arrow to the right of the Border icon in the Font group. The Border menu lists different ways to place borders around cells. Excel displays your chosen borders around the cells you selected in Step 1.